Because it contains so many different types of writing, the Bible isn't usually read from cover to cover as most modern books are (although it certainly can be). Rather, believers usually come to the Bible to read specific passages, like the stories about Jesus or the songs of praise written to God. 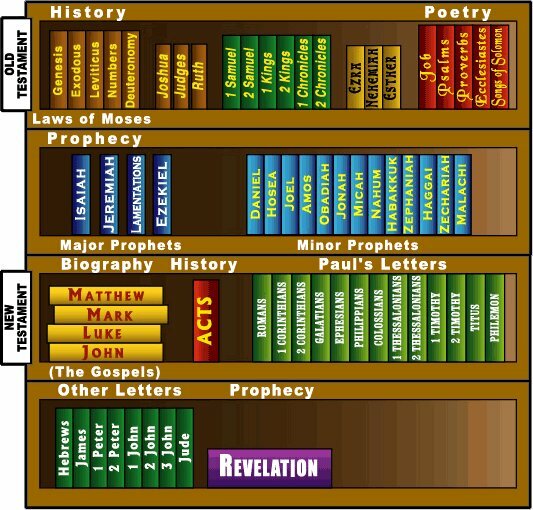 The picture to the right shows how the books of the Bible are grouped into categories (or genres). To understand why the Bible is composed of so many different books, it helps to know a little about the history of the Bible and how it came to be written. God began to inspire people to write down His messages to mankind about 3,000 years ago (the early dates are a little fuzzy). Over a period of about 1,600 years, at least forty different writers from different periods of history and different locations around the world recorded what God inspired them to say. And yet, despite this diverse group of writers, the Bible basically tells a single story: the story that leads people to Jesus, who was God's ultimate message to the world. The Bible may seem like an awfully BIG book. Some people think or they have heard that the Bible is mysterious or hard to understand. They may have even been told that only ministers or priests can truly understand the Bible. That's why it helps to know what the Bible REALLY is: God's message for ALL people everywhere, intended to be read by ordinary people (everybody!). 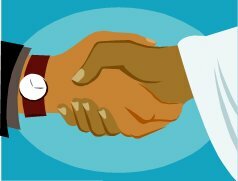 The word "testament" might make us think of a will ("last will and testament"): a legal document declaring a person's wishes about what happens to their property and possessions when they die. In the Bible, long before Jesus came to earth, God first expressed His will that people should know and worship Him as their ONLY God; in return, God would forgive men of their sins. The first division of the Bible, the Old Testament, is the story of how mankind responded to God's will. Because mankind did NOT follow God's will, God put in place a new way for them to be forgiven: sending Jesus, His only son, to earth to die for their sins. The stories of Jesus and those who chose to follow Him are the stories of God's New Testament, or will, for the human race He created. And so, the Bible is divided into the Old Testament and the New Testament: books that were written before Jesus came into the world and those that were written after. How Do I Find a Passage in the Bible? To make reading the Bible easier, it is very helpful to become familiar with the names of the books of the Bible. Even though it may seem like a hard task, it is most helpful to MEMORIZE all the names in order. Make a challenge to yourself to memorize 10 names a day. 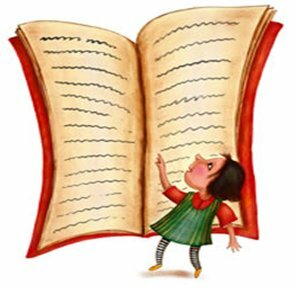 When you begin to memorize the next 10, be sure to say the previous ones you've memorized first, so that you'll be able to recite them all in order. A list of the books of the Bible follows below. You can use this as your guide to memorizing them. Some of the names may seem hard to pronounce; for instance, the book of Job is pronounced as if it had an "e" on the end ("jobe"). If you have any questions about how to pronounce the name of a book, don't hesitate to ask your Bible study teacher or a minister at a church you attend. Open the Bible to any page and you will see many small paragraphs, each with a number. These are called verses. 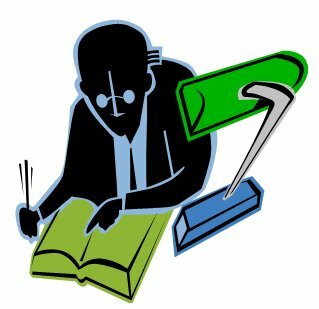 A collection of verses is called a chapter (and not all chapters have the same number of verses). The only exceptions to this are the book of Obadiah in the Old Testament and the books of Philemon, 2 and 3 John, and Jude in the New Testament; they aren't divided into chapters. When people refer to specific passages in the Bible, they use what is called "chapter and verse." If someone wanted you to find the sixteenth verse in the third chapter of the book of John, you would probably see it written this way: John 3:16. This is where memorizing the names of the books of the Bible comes in handy: you'll know that John is the fourth book in the New Testament. After finding the book of John, you would then look for the third chapter, and, finally, the sixteenth verse. All references to passages in the Bible are written as above with John 3:16 (sometimes the book's abbreviation is used). If more than one verse is being referred to, it would be written this way: Exodus 20:1-17. This means that you would find the first seventeen verses of the twentieth chapter of the book of Exodus. Piece of cake! Previous: Why Read the Bible?